Yonge Street was first laid out in 1794 by surveyor Jones, who had married Tuh-ben-an-nee-quay, the daughter of the Indian Chief, Washbenbeay, and who was the father of the Rev. Peter Jones, a famous missionary preacher in pioneer days. The survey was started on January 4, 1794, and reached Holland Landing on February 16th. The survey began at a post near the Toronto bay at the foot of Yonge Street, and the mileage was marked at each mile by the description of a prominent tree. There stands (in 1950) still the 13 mile tree on the north brow of Thornhill hill on the East side of the road at the end of the lane on the Heintzman farm. In 1794 the conditions for granting of land were that the settler must build a dwelling 16 feet by 20 feet of logs or frame, with a shingle roof, and must cut down all the timber in front of, and the whole width of the lot and 35 feet in depth, which must be cleared smooth and left for half the public road, inside of two years. Following the survey by Mr. Jones, the Queen's Rangers cut the road through to Holland Landing, but there was little work done on it until December 10, 1800, when the Acting Surveyor General asked Mr. John Stegman to report on the condition of the road. 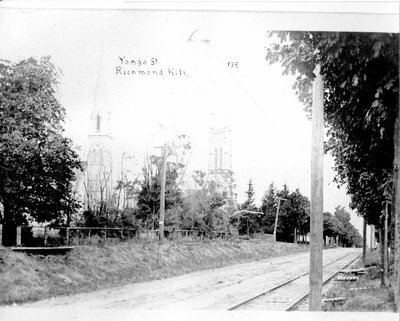 Mr. Stegman began his report dated 1801 as follows, ”that from the town of York to the Poplar Plains (Bloor Street) the road is cut, but is not passable on account of the logs that lie in the Street". After reporting for York Township he said of Vaughan no.33 clearing completed, with no house, and nothing done to the street". Markham side was cleared, and as no unfavorable comment was made on the lots through Richmond Hill them first owners must have done their road work. 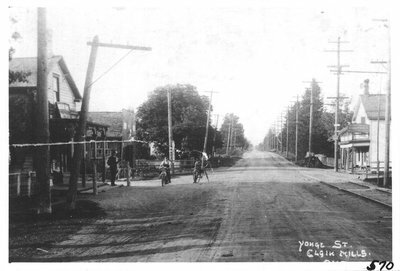 Yonge Street was a road of great military importance between York and Penetanguishene it had to be put in a passable condition. With the Government’s assistance and the expenditure of £8,000 by the Northwest Trading Company, it was lifted out of its footpath status, but long maintained its muddy character. 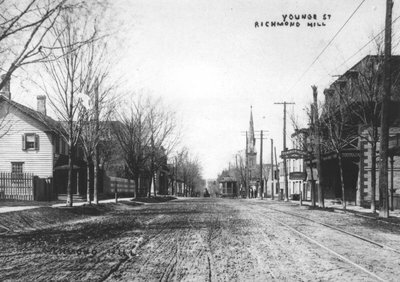 To the North of Richmond Hill there was a corduroy road, through what was marked as Black Ash Swamp on the earliest map, another corduroy road ran south from the village to the toll-gate at Langstaff corner. 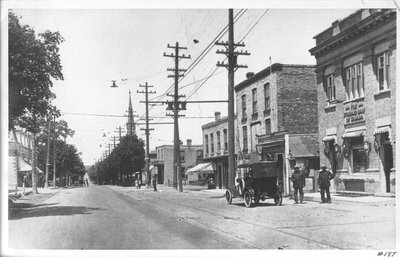 Later the Yonge Street road was made firmer south from Richmond Hill, by the use of broken stone. This was bought from the farmers by the cord or which consisted of a pile 8’ long by 4’ wide and high. It was broken by hand labour, and the keeping up of the road was the responsibility of the toll-gate keepers with certain sections assigned to each On March 4,1799 the Parliament appointed Mr. John Hendrix (or Hendricks) as overseer of roads and fence viewer for lots 41 to 51 Markham and Vaughan Townships. The fences were to be feet high. At the same time Balser Munshaw was appointed constable for Vaughan and 1st Concession of Markham with a yearly allowance of £5.